Objective: The superior cluneal nerve (SCN) may become entrapped where it pierces the thoracolumbar fascia over the iliac crest; this can cause low back pain (LBP) and referred pain radiating into the posterior thigh, calf, and occasionally the foot, producing the condition known as “pseudo-sciatica.” Because the SCN was thought to be a cutaneous branch of the lumbar dorsal rami, originating from the dorsal roots of L1–L3, previous anatomical studies failed to explain why SCN causes “pseudo-sciatica”. The purpose of the present anatomical study was to better elucidate the anatomy and improve the understanding of “pseudo-sciatica” from SCN entrapment. Materials and methods: SCN branches were dissected from their origin to termination in subcutaneous tissue in 16 cadavers (5 male and 11 female) with a mean death age of 88 years (range 81–101 years). 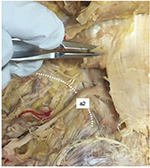 Special attention was paid to identify SCNs from their emergence from nerve roots and passage through the fascial attachment to the iliac crest. Results: Eighty-one SCN branches were identified originating from T12 to L5 nerve roots with 13 branches passing through the osteofibrous tunnel. These 13 branches originated from L3 (two sides), L4 (six sides), and L5 (five sides). Ten of the 13 branches showed macroscopic entrapment in the tunnel. Conclusion: The majority of SCNs at risk of nerve entrapment originated from the lower lumbar nerve. These anatomical results may explain why patients with SCN entrapment often evince leg pain or tingling that mimics sciatica. The sciatic nerve is formed by the fourth and fifth lumbar nerve roots and the first two sacral nerve roots. Sciatic pain usually radiates along a broad line from the middle or lower buttock, proceeding dorsolaterally in the thigh due to compression of the L5 nerve root and posteriorly with compression of a1. With less frequent L4 compression, the pain is anterolateral in the thigh.20 Earlier anatomical studies16,21,22 revealed that the medial branch of the SCN is composed of the lateral branch of posterior rami of L1, L2, or L3, thus referred pain would appear in the groin or anterior thigh. Therefore, these previous studies do not explain how SCN entrapment causes pseudo-sciatica. To address this issue, the study presented here focuses on the origin of SCNs passing through the osteofibrous tunnel. Bilateral branches of the SCN were observed macroscopically in 5 male and 11 female formalin-preserved cadavers with a total of 23 sides and a mean death age of 88 years (81–101 years). Branches of the SCN were identified where they pierced the dorsal layer of the thoracolumbar fascia or where they passed between the ventral and dorsal layers of the fascia just above the iliac crests. Branches of the SCN were dissected proximally to the intervertebral foramen to identify their point of emergence from nerve roots and distally to the point where they disappeared into the subcutaneous tissue of the buttock. The number of SCN branches was counted where they pass over the iliac crest. Each nerve root was identified in relation to lumbosacral junction and/or the 12th rib (Figures 1 and 2). 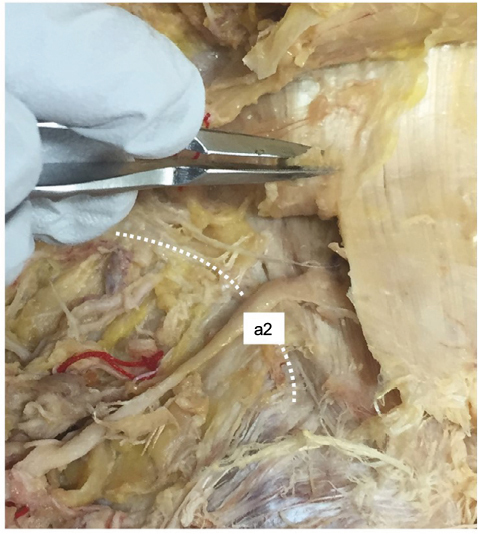 SCN branches were classified as penetrating the superficial layer of thoracolumbar fascia before crossing the posterior iliac crest or passing through the gluteal fascia after crossing the iliac crest. Penetrating the fascia below the iliac crest is defined as passing through the osteofibrous tunnel. Particular attention was paid to the observation of a constriction of the SCN branch in the osteofibrous tunnel. Linear distances from the midline and the posterior superior iliac spine (PSIS) to the SCN branches over the iliac crest were measured using a digital caliper (Mitsutoyo Corp., Kawasaki, Japan). Figure 1 Photograph and the corresponding illustration showing five branches of the SCN on the left side of a specimen obtained from the cadaver of a 90-year-old woman (specimen no. 8). The most lateral branch (a5) had separate origins from the T12 and L2 nerve roots. The third most medial branch (a3) had separate origins from the L2 and L3 nerve roots. Abbreviation: SCN, superior cluneal nerve. This anatomical study was approved by the Institutional Ethics Committee of our institution (Tokyo Medical University No. 2843). Cadaveric donors designated for education or research participated in this study. A total of 81 SCN branches were identified on the 23 examined sides. Numbers of SCN branches as they crossed the iliac crest in each specimen were three (15 sides), four (four sides), and five (four sides). Levels of nerve roots originating SCN branches are shown in Table 1. Of the 81 SCN branches, four branches had a separate origin from multiple nerve roots, three from two nerve roots (specimen no. 8 and 22), and one from three nerve roots (specimen no. 17) (Figures 1 and 2). Six nerve roots had dorsal branches ramifying into multiple SCN branches (specimen no. 6–8, 11, 17, and 22) (Figure 2). The most medial branch of the SCN originated from L3 (two sides), L4 (10 sides), L5 (10 sides), and one branch had separate origins from L2, L3, and L4 nerve roots. In one specimen, the most medial SCN branch anastomosed with the middle cluneal nerve in the mid-buttock subcutaneous tissue. The second most medial branch of the SCN originated from L1 (one side), L2 (two sides), L3 (nine sides), L4 (nine sides), and L5 (two sides). Notes: ○: The most medial branch. △: The second most medial branch. □: The third most medial branch. ▽: The fourth most medial branch. ☆: The most lateral branch. Under bar (_): represents branch passing through osteofibrous passing through tunnel. Black marks represent branch with possible entrapment. Black symbols represent entrapped branches within the osteofibrous tunnel. Figure 2 Photographs and the corresponding illustration showing three branches of the SCN on the right side of a cadaveric specimen obtained from an 89-year-old man (specimen no. 22). The L5 nerve roots had a dorsal branch ramifying into the most medial SCN branch (a1) and the second most medial branch (a2). The lateral branch of the SCN (a3) had separate origins from the L2 and L3 nerve roots. Thirteen of the 81 SCN branches passed through the osteofibrous tunnel. Seven sides (specimen no. 3, 10, 11, 13, 14, 21, and 23) had one SCN branch and three sides (specimen no. 6–8) had two SCN branches passing through the osteofibrous tunnel. These 13 branches originated from L3 (two sides), L4 (six sides), and L5 (five sides). Of these, nine were the most medial branches originating from L4 (four branches) and L5 (five branches), three were the second most medial branches from L3 (one branch) and L4 (two branches), and one was the third most medial branch from L3. Ten of the 13 branches passing through the osteofibrous tunnel had obvious entrapment (Figure 3). 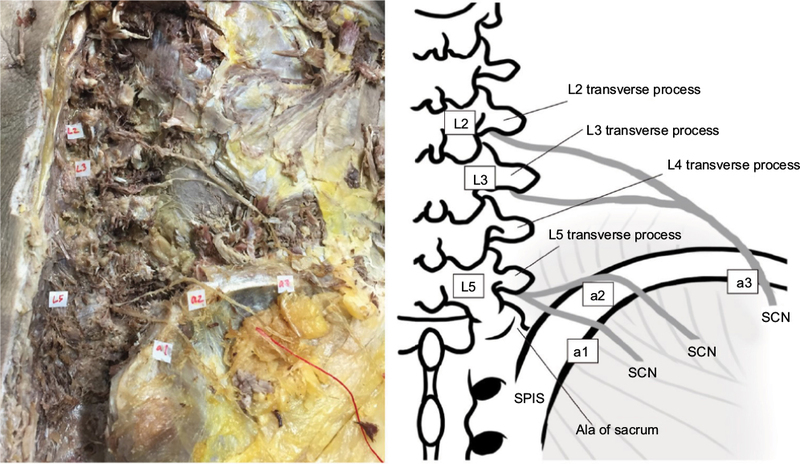 Of these 10 branches entrapped in the tunnel, seven nerves were the most medial branch originating from L4 (three branches) and L5 (four branches), two were the second most medial branch from L3 (one side) and L4 (one side), and one was the third most medial branch from L3. Figure 3 Photographs showing entrapped branches of the medial branch of the SCN in cadaveric specimen no. 23. a2 is the second most medial branch of SCN. Distances from the midline and the PSIS to the branches of the SCN crossing over the iliac crest, and the diameters of the SCNs are shown in Table 2, summarized by level of origin from nerve roots. The mean distance from the midline to the SCN branches passing through the osteofibrous tunnel was 66.1 mm (42.4–87.2 mm), measured laterally on the iliac crest. The mean linear distance from the PSIS to the SCN branches passing through the osteofibrous tunnel was 40.8 mm (17.8–66.3 mm). The diameter of SCNs ranged from 0.3 to 2.9 mm (mean 1.6 mm). Abbreviations: SCN, superior cluneal nerve; PSIS, posterior superior iliac spine. Many textbooks or photos in anatomical reports17,24,25 illustrate that SCNs arise from the thoraco-lumbar junction or upper lumbar levels. 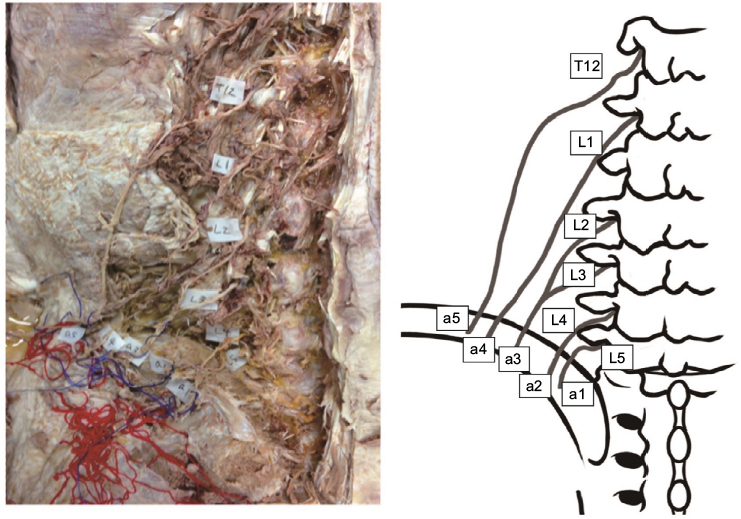 In previous anatomical studies, the medial branch of the SCN was found to comprise the cutaneous branches of the dorsal rami of the upper three lumbar nerves (L1–L3).16,21,23–25 Maigne et al22 described that SCNs arose from T11 to L3 nerve roots and that the lateral dorsal rami of L4 and L5 had no cutaneous branches. Engel and Bogduk30 studied the lumbar dorsal rami and found that the L1–L3 lateral branches pierced the thoracolumbar fascia and became cutaneous, whereas the L4 lateral branch remained entirely intramuscular and no lateral branch arose from L5. Aizawa and Kumaki23 described SCNs originating from dorsal roots of T12 to L4. In contrast, our study found SCNs arising from T12 to L5 nerve roots. It was formerly believed that all branches of the SCN pierce the thoracolumbar fascia above the iliac crest11,19,23,31–35 until Maigne et al found entrapment of the most medial branch in the osteofibrous tunnel. Subsequent cadaveric dissections by Maigne et al,22 Lu et al,27 and Xu et al36 determined that the medial SCN branch consistently passes through the osteofibrous tunnel while the intermediate and lateral branches never pass through the osteofibrous tunnel.11,22,27,34 Agur24 found that 80% of the medial branches passed through the osteofibrous tunnel, while Yazaki et al29 reported this number to be 95%. Kuniya et al8 dissected 59 cadavers and found 56% to have at least one branch running through an osteofibrous tunnel; 36% had one branch, 17% had two branches, and 3% had three branches in the osteofibrous tunnel. In our study, 30% (7/23) had one SCN branch and 13% (3/23) had two SCN branches passing through the osteofibrous tunnel. Nine of 13 SCN branches passing through the osteofibrous tunnel were the most medial branch, three were the second most medial branch, and one was the third most medial branch. Maigne et al22 reported that the SCNs passing through the osteofibrous tunnel arose from L1 nerve roots in 60%, L2 in 27%, and L3 in 13%. In the present study, we found SCN branches passing through the osteofibrous tunnel originated from L3 to L5 nerve roots. Several investigations found the SCN passing 70–80 mm laterally over the iliac crest.18,22 Our results determined that the average distance from midline to the SCNs passing through the osteofibrous tunnel was 66.1 mm (42.4–87.2 mm) and that the mean linear distance from the PSIS to the SCN was 40.8 mm. The differences between previous reports and our study may arise from differing purposes of the studies. Previous studies were intended to define the lateral cutaneous branches innervation of the lower back22 or how to alleviate pain at the iliac crest following bone harvest.16 While seeking the cutaneous innervation of the lower back, Maigne et al22 unexpectedly found entrapment of the most medial branch of the SCN in the osteofibrous tunnel in two of 37 dissections. In their report, these authors observed tiny medial branches crossing the crest that were impossible to trace. In contrast, our aim was specifically to identify SCNs at risk of entrapment and their origin from nerve roots. In addition, our observations were done with the knowledge that there are several anatomical variations in the running course of the SCN branches and that multiple branches may pass through the osteofibrous tunnel.8,28 We were also careful to preserve the thin branches and anastomoses passing through the osteofibrous tunnel. In addition, the proportion of constriction of the SCN in the osteofibrous tunnel, 30% or 7/23 specimens, in our study differs considerably from that of previous studies. Maigne et al reported that 5%, or 2/37, of his cadavers showed marked compression of the medial branches of the SCN in the osteofibrous tunnel.22 Kuniya et al observed severe constriction of the SCN in the bony groove covered by the fascial attachment of the gluteus muscle to the iliac crest in only two out of 109 specimens.8 Because true constriction is rare and repetitive friction between the SCN and fascia, even without direct compression by the ilium, can cause severe symptoms,12,28 we included moderate constriction of the SCN in the osteofibrous tunnel in our results. We have identified more extensive spinal nerve origins of SCNs ranging from T12 to L5. We indicated that predominantly the L4 and L5 lateral branches run through the osteofibrous tunnel in the fascia overlying the iliac crest. This evidence can explain how SCN entrapment disorder causes various leg symptoms mimicking sciatica. Our study provides an anatomical assessment of SCN entrapment in the osteofibrous tunnel and a mechanism whereby this causes the leg symptoms of pseudo-sciatica. Author contributions to the study and manuscript preparation are as follows: YA contributed to drafting the manuscript; TK performed data analysis; all authors contributed toward data analysis, drafting and revising the paper and agree to be accountable for all aspects of the work. Deyo RA, Weinstein JN. Low back pain. N Engl J Medicine. 2001; 344(5):363–370. Balague F, Mannion AF, Pellise F, Cedraschi C. Non-specific low back pain. Lancet. 2012;379(9814):482–491. Fernyhough JC, Schimandle JJ, Weigel MC, Edwards CC, Levine AM. Chronic donor site pain complicating bone graft harvesting from the posterior iliac crest for spinal fusion. Spine. 1992;17(12):1474–1480. Tarulli AW, Raynor EM. Lumbosacral radiculopathy. Neurol Clin. 2007;25(2):387–405. Kuniya H, Aota Y, Saito T, et al. Anatomical study of superior cluneal nerve entrapment. J Neurosurg Spine. 2013;19(1):76–80. Kuniya H, Aota Y, Nakamura N, Kawai T, Tanabe H, Saito T. Low back pain patients with suspected entrapment of the superior cluneal nerve. J Spine Res. 2011;2(6):1032–1035. Japanese. Maigne JY, Doursounian L. Entrapment neuropathy of the medial superior cluneal nerve. Nineteen cases surgically treated, with a minimum of 2 years’ follow-up. Spine. 1997;22(10):1156–1159. Talu GK, Ozyalcin S, Talu U. Superior cluneal nerve entrapment. Reg Anesth Pain Med. 2000;25(6):648–650. Skandalakis JE. Essentials of human anatomy. JAMA. 1995;273(4):352–353. Aota Y, Kuniya H, Konno T, Kawai T, Saito T. Cluneal nerve: [Entrapment of the superior/middle cluneal nerves can cause leg pain and/or tingling, and may mimick lumbo-sacral spinal disorders.] J Spine Res. 2014;5(6):951–955. Japanese. Trescot AM. Cryoanalgesia in interventional pain management. Pain Phys. 2003;6(3):345–360. Ropper AH, Zafonte RD. Sciatica. N Engl J Med. 2015;372(13):1240–1248. Netter FH. Atlas of Human Anatomy. Philadelphia, PA: Elsevier Health Sciences; 2010. Maigne JY, Lazareth JP, Guerin Surville H, Maigne R. The lateral cutaneous branches of the dorsal rami of the thoraco-lumbar junction. An anatomical study on 37 dissections. Surg Radiol Anatomy. 1989;11(4):289–293. Aizawa Y, Kumaki K. [The courses and the segmental origins of the cutaneous branches of the thoracic dorsal rami]. Kaibogaku Zasshi. 1996;71(3):195–210. Japanese. Agur AM, Dalley AF. Grant’s Atlas of Anatomy. Philadelphia, PA: Lippincott Williams & Wilkins; 2009. Standring S, Ellis H, Healy J, et al. Gray’s anatomy: the anatomical basis of clinical practice. Am J Neuroradiol. 2005;26(10):2703. Bogduk N, Long DM. The anatomy of the so-called “articular nerves” and their relationship to facet denervation in the treatment of low-back pain. J Neurosurg. 1979;51(2):172–177. Lu J, Ebraheim NA, Huntoon M, Heck BE, Yeasting RA. Anatomic considerations of superior cluneal nerve at posterior iliac crest region. Clin Orthop Relat Res. 1998(347):224–228. Yazaki S, Ohwaki Y, Urata S, Watanabe K. [Chronic posterior iliac crest donor site pain and anatomic considerations for superior cluneal nerves.] Seikei Geka. 1997;48(4):397–403. Japanese. Engel R, Bogduk N. The menisci of the lumbar zygapophysial joints. J Anatomy. 1982;135(Pt 4):795–809. Asano S, Kaneda K. [Cause and management of donor site pain after harvesting autologous iliac bone grafts.] Sekitsui Sekizui. 1993;6(3):191–195. Japanese. Banwart JC, Asher MA, Hassanein RS. Iliac crest bone graft harvest donor site morbidity. A statistical evaluation. Spine. 1995;20(9):1055–1060. Kurz LT, Garfin SR, Booth RE Jr. Harvesting autogenous iliac bone grafts. A review of complications and techniques. Spine. 1989;14(12):1324–1331. Hutchinson MR, Dall BE. Midline fascial splitting approach to the iliac crest for bone graft. A new approach. Spine. 1994;19(1):62–66. Mirovsky Y, Neuwirth MG. Comparison between the outer table and intracortical methods of obtaining autogenous bone graft from the iliac crest. Spine. 2000;25(13):1722–1725. Xu R, Ebraheim NA, Yeasting RA, Jackson WT. Anatomic considerations for posterior iliac bone harvesting. Spine. 1996;21(9):1017–1020.